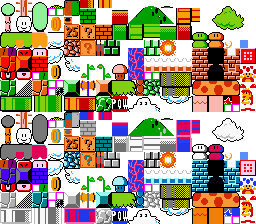 This is my Super Mario Bros. remake tileset, though it also contains any tile you'd ever need from The Lost Levels, All Night Nippon, Super Mario Bros. Special (PC88 version), and Mario Clock, and some other tiles only used in remakes, such as the blocks from Super Mario Bros. Deluxe. Feel free to use them without credit. Full tileset, Map 16 & all, coming soon! This is my SML tileset. It's incomplete at the moment, though it's still good enough to pull off world 1 of SML. Nice work. 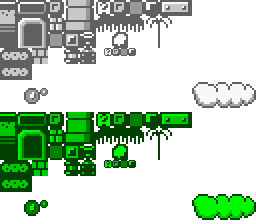 But is there an advantage to having every level theme in one tileset, rather than spread out across multiple ones? You just answered your own question. Why would I want to have the same amount of tiles spread across multiple tilesets when I can have them all in one tileset? Yeah there is! It's if you wants to make a very long level using multiple views to make a short remake in your hack without to use many tilesets that you won't reuse anywhere else in your hack. Edit: Ninja'd, making my post pretty useless. It is convenient to have as much as you can fit in a single tileset. For the record, my new hack only uses about 7 tilesets in total. NO WAY!? NO WAY?! NO WAY!? Would anyone be willing to make an .nmt for this so people don't have to mess with it? Hey, what do you know! I was the 777th poster in the NSMB Hacking Sub-forum! I'm lucky! How do download the tileset? I tried saving it then making it a .nmt file but that didn't work. Noice Stuff u got there. I Love it! I wonder what this would look like in game. It would be cool seeing 3D mario run around in his old 2D land. This is gonna look nice!